McLELLAN, JAMES ALEXANDER, educator and author; b. 1832 in Shubenacadie, N.S., son of John McLellan and Hannah Ellis; brother of Mary McLellan; m. 1851 Harriet Tounsley of Toronto, and they had five daughters and three sons; d. 11 Aug. 1907 in Toronto. James A. McLellan received his early education in Nova Scotia and began his teaching career there at age 15. By 1856 he had served as principal of the central school in Oshawa, Upper Canada. He received his certificate from the Toronto Normal School in 1857 and in 1858 was appointed to the central school in St Marys. The trustees later stated that he was “everything we could wish as a teacher,” an exemplar of the normal-school system, and an able administrator. He served there until 1860 when he enrolled in the University of Toronto. In 1861 he taught in the St Marys Grammar School and upon receiving his grammar school teaching certificate in 1862 he became principal. McLellan was a dedicated, but selective, teacher. He wrote a weekly column, the “Students’ Corner,” for the St. Mary’s Weekly Argus in 1860, promoting the development of skills in grammar and mathematics; on Saturday mornings he conducted extra classes for his superior pupils. The testimonials to himself that he later published indicate his efforts were generally appreciated; however, in 1861 the Argus had accused him of “egotism and ungentlemanly insinuations” after he denied accusations that he neglected slower students. McLellan continued to be known for his scholarship and energetic teaching while he served as principal and worked toward his ba (received in 1862) and ma (1863) through the University of Toronto. (He would be awarded an llb in 1872 and an lld in 1873.) 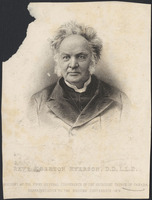 His reputation was established by the time he left St Marys in 1864, taking with him letters of reference from the inner circle of the educational élite in Upper Canada: Egerton Ryerson*, Thomas Jaffray Robertson*, and Daniel Wilson*. From 1864 to 1869 McLellan was principal of Yarmouth Seminary, in Yarmouth, N.S., where he taught classics, mathematics, and English history and grammar. He was also active in the cause of British North American confederation. He returned to Ontario in 1869 and served for two years as a mathematics master at Upper Canada College. There his reputation as a scholar of originality grew, along with his strictness as a disciplinarian. In 1871 McLellan was appointed an inspector of high schools on the recommendation of Ryerson, and in 1875 he was made the director of normal schools in Ontario. He became one focus of a public inquiry in 1877 after accusations were made that he had colluded with schoolmaster Thomas Kirkland to promote the sale of Kirkland’s textbook on statics. The judge who conducted the inquiry exonerated both men. Soon, however, McLellan was at the centre of another controversy, when in April 1879 the Canada Educational Monthly (Toronto) claimed he was taking advantage of his rank to get his own books used in schools even though they had not been authorized by the Education Department. The stir caused by these charges does not seem to have impeded McLellan’s advance. The Ontario Educational Association, which had elected him vice-president in 1861, chose him as president in 1878, 1879, and 1885. In 1890 he was appointed head of the School of Pedagogy in Toronto. After it was moved to Hamilton in 1897 as the Ontario Normal College, McLellan served as principal and professor of the psychology, history, and philosophy of education for the rest of his career. Besides playing a role in the training of teachers, McLellan contributed to education in Ontario primarily in the areas of mathematics and psychology. In each his motto was “True knowledge has its beginning and end in action,” an aphorism which appropriately suggests links with American Pragmatists such as John Dewey. His mathematical interests were technically oriented and were concerned with relating the material to the students’ experience. He advocated an approach to problem solving that laid no stress on formal rules. Among McLellan’s published works are Mental arithmetic (1878), the 15th edition of which appeared in 1892, and The teacher’s handbook of algebra . . . (Toronto, 1879). In the area of psychology McLellan’s ideas had a broader scope. He believed this science could transform teaching from a “mere trade” to a profession concerned with the training of the will, emotions, intellect, and body, and the development of the “actual, individual self.” He wished, however, to see it used only by intellectually and morally trained teachers. His Applied psychology: an introduction to the principles and practice of education (Toronto, [1889?]) served as a text in normal schools from 1895 to 1903. In the preface McLellan acknowledged his debt to John Dewey. (Although Dewey was not the co-author, his name appeared alongside McLellan’s in an American edition published sometime after 1892.) McLellan and Dewey did collaborate on The psychology of number and its applications to methods of teaching arithmetic (New York, 1895), a text on the value of psychology in the teaching of mathematics. By the early 1890s, McLellan had established a reputation among American educators such as William Torrey Harris, the commissioner of education, and others in the National Education Association of the United States. Under the auspices of that organization McLellan served as vice-president of the International Congress of Education held in Chicago in 1893. James Alexander McLellan collected testimonials to himself and published them under the title Testimonials of scholarship, etc., of J. A. McLellan, m.a. (Toronto, 1871). In addition to the works cited in the biography, he is the author of numerous textbooks and other publications on educational matters. Listings of these works appear in CIHM Reg. and Canadiana, 1867–1900. Globe, 12 Aug. 1907: 12. Hamilton Spectator, 13 Aug. 1907. St. Mary’s Weekly Argus (St Marys, Ont. ), July–August 1860, 10–17 Jan. 1861. John Dewey, The early works, 1882–1898, ed. J. A. Boydston et al. (5v., Carbondale, Ill., 1967–72). Documentary history of education in Upper Canada from the passing of the Constitutional Act of 1791 to the close of Rev. Dr. Ryerson’s administration of the Education Department in 1876, ed. J. G. Hodgins (28v., Toronto, 1894–1910), 23: 161–79. E. C. Guillet, In the cause of education; centennial history of the Ontario Educational Association, 1861–1960 (Toronto, 1960), 80–83. A history of Upper Canada College, 1829–1892 . . . , comp. George Dickson and G. M. Adam (Toronto, 1893), 120. John Dewey: a centennial bibliography, ed. M. H. Thomas (Chicago, 1962), 4, 10–11. Ont., Legislature, Sessional papers, 1878, no.11; Minister of Education, Report (Toronto), 1901; 1907: xxvi–xxvii. Ontario Normal College handbook, containing a list of students in attendance, with their home addresses, and the officers of the various societies ([Hamilton, Ont.? ]), 1902–3 (copy in AO, Pamphlet Coll., 1902, no.65). Viola Parvin, The authorization of textbooks for the schools of Ontario (Toronto, 1965), 55–57. Egerton Ryerson, My dearest Sophie: letters from Egerton Ryerson to his daughter, ed. C. B. Sissons (Toronto, 1955), 204. Robert Lanning, “McLELLAN, JAMES ALEXANDER,” in Dictionary of Canadian Biography, vol. 13, University of Toronto/Université Laval, 2003–, accessed April 24, 2019, http://www.biographi.ca/en/bio/mclellan_james_alexander_13E.html.